FreshWater Watch partners in the USA, the Alliance for the Great Lakes, has achieved a big win for fresh water. Following a public education campaign by the Alliance for Great Lakes, and a report from the Attorney General for New York, Erie County in New York State has banned the sale of personal care products containing all forms of microbeads. A microbead is a tiny plastic ball, less than 5mm in size, used in exfoliating soaps, scrubs, face cleansers and toothpaste. After tests showed microbeads present in water samples taken from 74% of waste water treatment plants, a total of 34 treatment plants across New York State. It is estimated that nearly 19 tons of microbeads are washing in to New York’s wastewater every year. Executive Mark Poloncarz signs the legislation banning microbreads. He is joined by representatives of the NYS Attorney General's office and environmental advocates. Nate Drag, Alliance for the Great Lakes, far left. County County Legislator Patrick Burke 2nd from left. Microbeads can’t dissolve, yet they are so small and buoyant that they escape the filters in water treatment plants. So they gather in water bodies and can absorb other pollutants and chemicals which already pollute the Great Lakes. Fish confuse the microbeads for food and so these tiny pieces of plastic enter the food chain. Ongoing research has found microplastics in the digestive systems of 25 Great Lake fish and bird species. This is a big concern because, once treated, a large amount of New York’s waste water flows into the Great Lakes, which are the largest freshwater lakes on earth, with 20% of the world’s surface fresh water. Also, fish and other aquatic species consume concentrated pollutants, end up on our plates. Do my products contain microbeads? You may already know if you have microbeads in your bathroom cabinet, because of the texture of the product or you bought it for its exfoliating properties to help scrub away dead skin cells or shine your teeth to a glistening white. If you’re not sure, check the ingredients list as microbeads are often listed as polyethylene or polypropylene, the same plastic that is used to make bin bags. Connecticut, Colorado, Illinois, Indiana, Maine, Maryland, New Jersey and Wisconsin have similar laws, with Illinois being the first to enact a statewide ban. The ban in Erie County, NY, however has raised the bar for future legislation. Unlike the other statewide bans that have passed, Erie County has banned all forms of plastic microbeads. This includes traditional nonbiodegradable plastic microbeads and any alternative plastic product component that could continue to damage the environment, like biodegradable plastic microbeads. There are concerns that there is currently not an accepted standard for biodegradability for plastic in natural settings like the Great Lakes. Which means that biodegradable plastic microbeads may perpetuate the problem. 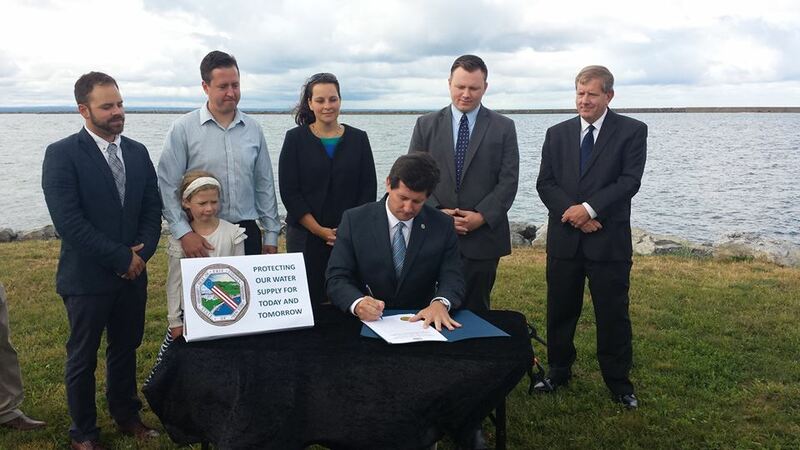 To continue the success in Erie County, The Alliance for the Great Lakes is continuing its campaign in New York State, across the Great Lakes, and on the federal level. While the New York State Legislature is in recess, the Alliance will be working with other counties in New York to pass similar legislation. As more counties take action on the issue, the Alliance hopes New York State will follow suit and pass strong legislation. The Alliance has testified for a Congressional committee this spring and continues to work together with a national coalition of organizations and agencies to achieve this goal. Make your own microbeads: Whilst manufacturers try to synthesise a biodegradeable microbread alternative there is concern that these are not biodegradeable under ordinary conditions in freshwater, and are merely substituting one pollutant with a new pollutant. Advocates of natural products are pointing to recipes for homemade scrubs containing ground almonds, oatmeal or pumice.